Ariocarpus hybrid scapharostrus x retusus hort. 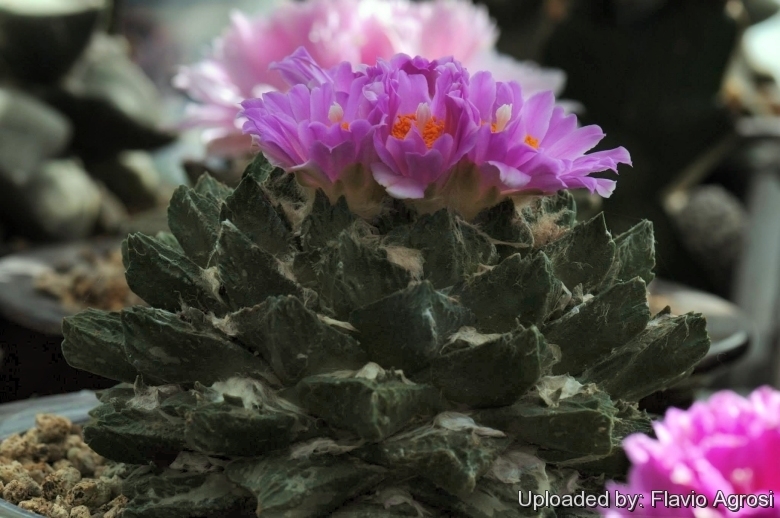 Description: It is a small slow growing solitary "living rock" cactus obtained by crossing ♀ Ariocarpus scapharostrusx ♂ Ariocarpus retusus. The superb features of this rare plant are due to the intersection between the traits of the ancestors.The flower are also very beautiful. This hybrid is very variable and differences among specimens may be considerable. Ariocarpus hybrid agavoides x elongatus hort. Ariocarpus hybrid fissuratus x agavoides hort. Ariocarpus hybrid lloydii x retusus hort. Ariocarpus hybrid retusus x fissuratus hort. Cultivation and Propagation: It’s a relatively easy species to cultivate, but very slow growing. Needs a very well drained soil. Requires strong sun to part sun to develop good spinal growth and waterings should be rather infrequent, to keep the plant compact and not become excessively elongated and unnatural in appearance. Keep dry in winter, or when night temperatures remain below 10° C (but some people give this plant a light monthly watering to prevent the drying and shedding of the lower tubercles.) it is hardy to -4°C for a short period. Assure a good ventilation. Propagation: It can be reproduced by seeds. Young seedlings are tiny and they need several years to reach adult size, and require very careful watering. Many growers graft tiny 2-3 month seedlings and they grow on very successfully that way.